To think of a three-day commemoration of the death of the Lord, his repose in the tomb and his resurrection, when it has become commonplace to speak of Holy Thursday, Good Friday, Holy Saturday, and Easter Sunday takes a little adjustment in our minds on how to calculate the time in such a way that we see the unity of the Triduum, and not disconnected celebrations. One way to see the unity of the Triduum is to calculate time from sunset to sunset. From the sunset on Thursday to the sunset on Friday is one day, the first day of the Triduum: the day of the death of the Lord. This helps us to see our celebration in the context of Saint Augustine who sees the three days as Friday, Saturday and Sunday. Adrian Nocent in his book The Liturgical Year points out that “in anticipation of the Eucharist celebration that will be the climax of the Paschal Vigil, the Church reminds us on Holy Thursday evening of the institution of the Eucharist at the Last Supper.” The sacrament makes really present in time and space the one sacrifice of Christ on Calvary and his victory over death through his Resurrection. Be attentive to the various signs and rituals of the Mass that point out he uniqueness of this night. First of all there will be no holy water in the font. Why? The fonts are waiting to be filled with the Easter water to be blessed at the Great Vigil. The tabernacle will be open and emptied with no sanctuary lamp lit. Why? These signs point once again to the Great Vigil when the sanctuary lamp will be lit from the newly-blessed Paschal Candle on the night all things are made new. Bells are rung during the Gloria. Why? Because the bells await to be rung at the Gloria in excelsis at the Great Vigil. Even the organ may only be used to support singing and then with great restraint until the Gloria at the Great Vigil. At the Mass of the Lord’s Supper the signs and rituals are already pointing us to the Great Vigil of Easter, the premier Liturgy of the ancient Christian Church. The priest will not give a blessing at the end of Mass. Why? Once again it points the Great Vigil when he will conclude the Mass with the priestly blessing. All these simple signs and gestures points out that on Thursday evening we begin a Liturgy that extends over the three days and concludes with the blessing at the Great Vigil. After Mass even all the crosses are removed from the church and if they cannot be removed they are to be veiled. Why? To prepare us to receive the cross into the church for our adoration on Good Friday. This text from Saint Paul’s Epistle to the Galatians keeps the unity of the Paschal Triduum in clear focus. We should GLORY! in the cross of Christ who was obedient unto death that God raised him on high to draw us into union with him. The church offers such a rich fare of readings that we can derive even greater spiritual benefit if we read them in the context of the prayers and ponder them before we come to the Church. Most striking this evening is the transfer of the Most Blessed Sacrament to the altar of the Mother of God accompanied by the chant Pange Lingua ( music, text ) for adoration until Midnight. Why Adoration? Through adoration we are drawn into a deeper union with Our Lord. Try to maintain a spirit of reflection and adoration in your homes this evening. Refrain from TV or radio and minimize social media so this night can be a night to wait and watch with the Lord until midnight when the Lord is taken and his trial begins through the night. 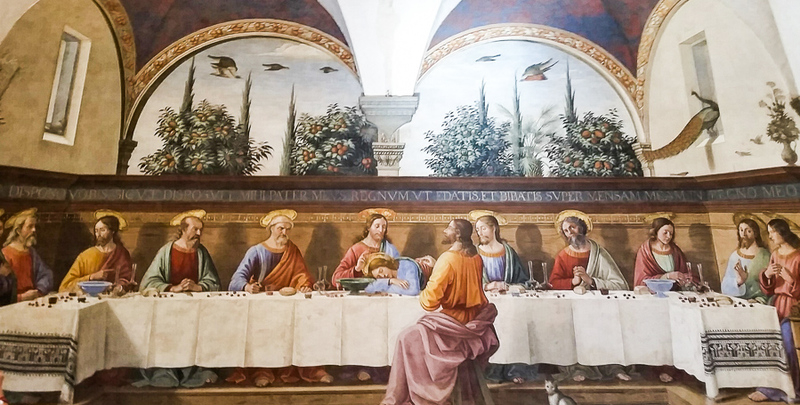 This entry was posted in Christianity and tagged Lent, Lord's Supper, Mass, Triduum on April 13, 2017 by frjfkauffmann. The Last Supper. Fresco by Ghirlandaio, in San Marco, in Venice. In medieval times it was thought that a mother pelican, in a time of famine, would pierce her own breasts to feed and sustain her chicks with her own blood. Thus the pelican is a symbol of Christ, who shed his blood so that we would live. This entry was posted in Lent, Liturgy and tagged Lent, Lord's Supper, Pange Lingua on March 24, 2016 by frjfkauffmann. This entry was posted in Lent, Liturgy and tagged Lent, liturgy, Lord's Supper, Pange Lingua on April 15, 2014 by frjfkauffmann.